For other uses, see Munro (disambiguation). A Munro ( listen (help·info)) is a mountain in Scotland with a height over 3,000 feet (914.4 m), the best known being Ben Nevis, the highest mountain in the British Isles. Munros are named after Sir Hugh Munro, 4th Baronet (1856–1919), who produced the first list of such hills, known as Munro's Tables, in 1891. The publication of the original list is usually considered to be the epoch event of modern peak bagging. The list has been the subject of subsequent variation. The 2012 revision, published by the Scottish Mountaineering Club, has 282 Munros and 227 subsidiary tops. "Munro bagging" is the activity of climbing all the listed Munros. They present challenging conditions to walkers, particularly in winter. As of 2017, more than 6,000 people had reported completing a round. The first continuous round was completed by Hamish Brown in 1974, whilst the record for the fastest continuous round is currently held by Stephen Pyke, who completed a round in just under 40 days in 2010. Before the publication of Munro's Tables in 1891, there was much uncertainty about the number of Scottish peaks over 3,000 feet. Estimates ranged from 31 (in M.J.B. Baddeley's guides) to 236 (listed in Robert Hall's third edition of The Highland Sportsman and Tourist, published in 1884). When the Scottish Mountaineering Club was formed in 1889, one of its aims was to remedy this by accurately documenting all of Scotland's mountains over 3,000 feet. Sir Hugh Munro, a founding member of the Club, took on the task using his own experience as a mountaineer, as well as detailed study of the Ordnance Survey six inches to the mile (1:10,560) and one-inch to the mile (1:63,360) maps. Munro researched and produced a set of tables that were published in the Scottish Mountaineering Club Journal in September 1891. The tables listed 538 summits over 3,000 feet, 282 of which were regarded as "separate mountains" The term Munro applies to separate mountains, while the lesser summits are known as tops. Munro did not set any measure of topographic prominence by which a peak qualified as a separate mountain, so there has been much debate about how distinct two hills must be if they are to be counted as two separate Munros. Campsite at Dubh-Ghleann, Glen Quoich, beside the river looking northwest to Beinn Bhreac. The Scottish Mountaineering Club has revised the tables, both in response to new height data on Ordnance Survey maps and to address the perceived inconsistency as to which peaks qualify for Munro status. In 1992, the publication of Alan Dawson's book Relative Hills of Britain, showed that three tops not already considered summits, had a prominence of more than 500 feet (152.4 m). Given this they would have qualified as Corbett summits had they been under 3,000 feet. In the 1997 tables these three tops, on Beinn Alligin, Beinn Eighe and Buachaille Etive Beag, gained full Munro summit status. Dawson's book also highlighted a number of significant tops with as much as 197 feet (60 m) of prominence which were not listed as Munro subsidiary tops. The 1997 tables promoted five of these to full Munro status. 197 Munros have a topographic prominence of over 150 m (492 ft) and are regarded by Peakbaggers as Real Munros. 88 Scottish mountains over 1000m, with a topographic prominence of over 200 m (656 ft) have been termed Metric Munros. Other classification schemes in Scotland, such as the Corbetts 2,500 to 3,000 ft (762–914 m) and Grahams 2,000 to 2,500 ft (610–762 m), require a peak to have a prominence of at least 500 feet (152 m) for inclusion. The Munros, however, lack a rigid set of criteria for inclusion, with many summits of lesser prominence listed, principally because their summits are hard to reach. During May and July 2009 the Munro Society re-surveyed several mountains that are known to be close to the 3,000 ft figure to determine their height more accurately. On 10 September 2009 the society announced that the mountain Sgùrr nan Ceannaichean, south of Glen Carron, had a height of 2,996 feet 10 inches (913.43 m). Therefore, the Scottish Mountaineering Club removed the Munro status of Sgùrr nan Ceannaichean and this mountain is now a Corbett. In a Summer 2011 height survey by The Munro Society, Beinn a' Chlaidheimh was found to be 2,998 feet 8 inches (914 m) and thus short of the Munro mark. In September 2012, the Scottish Mountaineering Club demoted it from Munro to Corbett status. As of September 2012, the Scottish Mountaineering Club lists 282 Munros and 227 subsidiary tops. Ben Lomond, 3,196 ft (974 m), the most southerly of the Munros. Ben Hope in Sutherland, 3,041 feet (927 m), is the most northerly Munro. Compared with some continental ranges, Scottish mountains might be modest in height, but walking and climbing in them can be treacherous because of their latitude and exposure to Atlantic and Arctic weather systems. Even in summer, conditions can be atrocious; thick fog, strong winds, driving rain and freezing summit temperatures are not unusual. Winter ascents of some Munros are serious undertakings due to the unpredictable weather, the likelihood of ice and snow, and poor visibility. Some walkers are unprepared for extreme weather on the exposed tops and fatalities are recorded every year, often resulting from slips on wet rock or ice. Some hillwalkers aim to climb every Munro, known as "Munro bagging". Munro-bagging is a form of peak bagging. A walker who has climbed all Munros is entitled to be called a Munroist. By May 2017, more than 6,000 people had completed the Munros. The Scottish Mountaineering Club, who maintain a list of those Munroists who have reported completing the Munros, have attempted to popularise the archaic spelling of compleation. Hugh Munro never completed his own list, missing out on Càrn an Fhidhleir and Càrn Cloich-mhuillin (downgraded to a "top" in 1981). Sir Hugh is said to have missed the Inaccessible Pinnacle of Sgùrr Dearg, on the Isle of Skye, which he never climbed. However the "In Pinn", as it is known colloquially within Scottish mountaineering, was only listed as a subsidiary top on his list (despite being several metres higher than Sgùrr Dearg, which was listed as the main top). The first "completionist" was to be the Reverend A. E. Robertson, in 1901, later minister at Braes of Rannoch from 1907. However, research has cast doubt on this claim, and it is not certain that he reached the summit of Ben Wyvis. Also it is known that Robertson did not climb the Inaccessible Peak of Sgùrr Dearg. If Robertson is discounted, the first Munroist is Ronald Burn, who completed in 1923. Burn is also (indisputably) the first person to climb all the subsidiary "tops". The person with the most rounds of Munros is Steven Fallon from Edinburgh, who has completed 13 rounds as of 2006. Chris Smith became the first Member of Parliament to complete the Munros when he reached the summit of Sgùrr nan Coireachan on 27 May 1989. Ben Fleetwood is probably the youngest person to have completed a round. He climbed the final Munro of his round – Ben More – on 30 August 2011 at the age of 10 years and 3 months. The youngest completionist to have done the round without the presence of a parent or a guardian is probably Andy Nisbet, who finished his round in 1972 aged 18 years and 1 month. Hamish Brown did the first continuous self-propelled round of the Munros (except for the Skye and Mull ferries) between 4 April and 24 July 1974 with 449,000 ft (137,000 m) of ascent and mostly walking 1,639 miles (2,638 km) – just 150 miles (241 km) were on a bicycle. The journey is fully documented in his book Hamish's Mountain Walk. The average time taken to bag all the Munros is eight years. The first reported completion of all the Munros plus the subsidiary tops in one continuous expedition was by Chris Townsend in 1996. His trip lasted between 18 May and 12 September (118 days), he covered a distance of 1,770 miles (2,849 km) (240 miles or 386 kilometres by bicycle) with 575,000 ft (175,000 m) of ascent. The round was broken twice for spells at the office, which could be regarded as stretching the meaning of "continuous". The first person to complete a winter round (all the Munros in one winter season) was Martin Moran in 1984/85. His journey lasted between 21 December 1984 and 13 March 1985 (83 days), he walked 1,028 miles (1,654 km) with 412,000 ft (126,000 m) of ascent. He used motor transport (campervan) to link his walk. In the winter of 2005/06, Steve Perry completed a continuous unsupported round entirely on foot (and ferry). He is also the first person to have completed two continuous Munro rounds, having also walked Land's End to John O'Groats via every mainland 3,000 ft mountain between 18 February 2003 and 30 September 2003. Charlie Campbell, a former postman from Glasgow, held the record for the fastest round of the Munros between 2000 and 2010. He completed his round in 48 days 12 hours, finishing on 16 July 2000, on Ben Hope. He cycled and swam between Munros; no motorised transport was used. His record was broken by Stephen Pyke of Stone, Staffordshire, in 2010 who completed the round in 39 days, 9 hours. Pyke's round started on the island of Mull on 25 April 2010 and finished on Ben Hope in Sutherland on 3 June 2010. He cycled and kayaked between Munros; no motorised transport was used. He was backed by a support team in a motor home, but had to camp out in the more remote areas. The women's self-propelled, continuous record is held by Libby Kerr and Lisa Trollope. They completed their round on 17th September 2017, in 76 days and 10 hours. On 18 September 2011 Alex Robinson and Tom O'Connell finished a self-propelled continuous round on Ben Hope in a time of 48 days 6 hours and 56 minutes. At the age of just 21, Alex became the youngest person to have completed a continuous round without the use of any motorised transport. The SMC recognises six peaks in England, fifteen in Wales and thirteen in Ireland that would be Munros or Munro Tops if they were in Scotland. These are referred to as Furth Munros, i.e. the Munros furth of Scotland. The first recorded Furthist is James Parker, who completed on Tryfan (Snowdonia) on 19 April 1929. Wikimedia Commons has media related to Munros. ^ "About the Scottish Mountaineering Club". The Scottish Mountaineering Club. Retrieved 6 September 2009. ^ McNeish, Cameron (14 December 2011). Munro Almanac. Neil Wilson Publishing. pp. VIII of 'Introduction'. ISBN 9781906476946. ^ "Real Munros". Peakbaggers. Retrieved 9 January 2018. ^ "Metric Munros". Peakbaggers. Retrieved 9 January 2018. ^ "Hill Bagging:Sgurr nan Ceannaichean". HillBagging. Retrieved 22 September 2014. ^ "SMC confirm new Munro Table 10th Sept 09". The Scottish Mountaineering Club. 10 September 2009. Archived from the original on 27 August 2009. Retrieved 10 September 2009. ^ "Fisherfield Munro demoted to Corbett status after coming up short in survey". STV News. 7 September 2012. Retrieved 10 September 2012. ^ "Beinn a'Chlaidheimh: the Munro Society surveyors respond". Caledonian Mercury. 29 August 2011. Retrieved 20 September 2013. ^ "Ben Nevis". Munro Magic. 2013. Retrieved 30 September 2013. ^ "Ben Lomond". Munro Magic. 2013. Retrieved 30 September 2013. ^ "Ben Hope". Munro Magic. 2013. Retrieved 30 September 2013. ^ "Ben Macdhui". Munro Magic. 2013. Retrieved 30 September 2013. ^ "Cairn Gorm". Walkhighlands. 2013. Retrieved 7 October 2013. ^ "Stob Dearg (Highland)". BBC Scotland. 2013. Retrieved 1 October 2013. 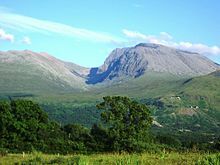 ^ "Beinn Eighe could lose Unesco Biosphere Status". BBC Highlands and Islands. BBC. 21 June 2012. Retrieved 3 October 2013. ^ Dan Bailey (September 2011). "UK Hillwalking Liathach". UKHillwalking.com. UKClimbing Limited. Retrieved 3 October 2013. ^ "Information about Lochnagar". www.munromap.co.uk. Retrieved 3 October 2013. ^ "Schiehallion". Walkhighlands. 2013. Retrieved 3 October 2013. ^ "Sgurr nan Gillean". Walkhighlands. 2013. Retrieved 3 October 2013. ^ "Information about Sgurr Alasdair". munromap.co.uk. Retrieved 3 October 2013. ^ "Sgurr Dearg – Inaccessible Pinnacle". www.hill-bagging.co.uk. Retrieved 3 October 2013. ^ Scottish Mountaineering Club Compleatists list. Archived 6 October 2013 at the Wayback Machine Gives compleatists at 5,234. Retrieved on 21 May 2013. ^ The Scottish Mountaineering Club. "Munro Compleatists". Archived from the original on 27 January 2010. Retrieved 1 July 2013. ^ a b c Peter Drummond. "In defence of A E Robertson". The Angry Corrie. Archived from the original on 9 July 2011. Retrieved 14 July 2009. ^ "The Munros" Page 5 Quote:"Sir Hugh himself never did manage the Inaccessible Pinnacle". ^ "The Munros and Tops 1891–1997". 11 January 2008. Retrieved 6 September 2009. ^ Drummond, Peter; Ian Mitchell (1993). The First Munroist – the Reverend A E Robertson. Ernest Press. ^ "Sgurr Dearg: The Inaccessible Pinnacle". Walking Stories. Retrieved 9 January 2018. ^ a b Russell, Fiona (5 January 2008). "Excess Baggage". The Herald Magazine. Retrieved 25 January 2008. ^ "Chris Smith, Scottish Mountaineering Club". Archived from the original on 27 September 2011. Retrieved 23 August 2011. ^ a b Dan Bailey, "The Youngest Munro Completer", ukclimbing.com, 2 September 2011. Retrieved 4 September 2011. ^ Brown, Hamish M. (1978). Hamish's Mountain Walk. Littlehampton Book Services. ^ Townsend, Chris (1997). The Munros and Tops: A Record Setting Walk in the Scottish Highlands. Mainstream Publishing. ^ Moran, Martin (1986). The Munros in Winter: 277 summits in 83 days. David & Charles. ^ "Interview: Steve Perry's Winter Munro Round". www.ukhillwalking.com. Retrieved 19 March 2019. ^ Watson, Jeremy (5 June 2010). "It's a marathon with a 10,000ft climb every day for five weeks – Munro record smashed". Edinburgh: The Scotsman. Retrieved 7 June 2010. ^ Moss, Tim (1 February 2018). "Running Up Every 'Munro' Mountain in Scotland". The Next Challenge. Retrieved 18 August 2018. ^ Bearhop, D.A. (1997). Munro's Tables. Scottish Mountaineering Club & Trust. ISBN 0-907521-53-3. ^ Parker, James A. (1929). "Beinn Tarsuinn and the British 'Threes'". Scottish Mountaineering Club Journal, XVIII, page 339. Scottish Mountaineering Club official Munros page, including completionists. Track your Munro progress and keep your friends up to date. Walk Highlands guide to the Munros – includes free OS maps and GPS routes for each Munro, and detailed descriptions. The Munros and Tops 1891–1997 – Spreadsheet showing changes in successive editions of Munros Tables. ScottishHills.com – Hillwalking forum with Munro, Corbett, Graham and Donalds log, maps and trip reports.